Image caption Defra has said that the outbreak, which is the largest in England this year, wont lead to a cull of the birds. An illness which led to the death of dozens of the Queen's swans in Windsor has been confirmed as bird flu, Defra has said. 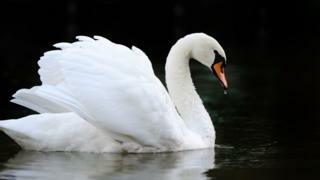 More than 30 of the swans on the River Thames have died and several more are "still dying". Seven of the dead birds were sent for testing on Monday after experts suspected an outbreak of avian flu. Defra has said that the outbreak, which is the largest in England this year, will not lead to a cull of the birds. Wendy Hermon from Swan Support is leading the clear up and said she is still seeing more birds becoming ill.
"It seems to take 48 hours from the start of them not looking very well to when they die," she said. Ms Hermon and her team are collecting dead birds "as quickly as they can from the water" in an effort to minimise the risk of the virus spreading. She told the BBC "following advice from the [Health and Safety Executive], we are bagging them up and spraying them with disinfectant on site, so there is no risk of spread." She explained that the team leave sick, but living, birds in situ to avoid contaminating other areas. Professor of virology at the University of Reading, Ian Jones, said he is hopeful that the outbreak can be contained. He told the BBC: "We are not in the situation that we were in last year when chickens were being kept indoors, we are a step before it. "The outbreak is only in wild birds so far, which is where we would like to keep it till the end of the season." David Barber, the Queen's Swan Marker, said experience from other places suggests "it will gradually burn itself out in two to three weeks." Mr Barber, who is responsible for the centuries old tradition of carrying out the annual swan census, said: "The flock have been at Windsor for many hundreds of years"
"We don't want them [tourists] to see the dead birds on the bank," he added. This outbreak comes days after a bird flu prevention zone was established across England to "help prevent the virus spreading". Public Health England advises that the risk to public health from avian influenza is very low.